Tapahtuman keynote-puhuja on jo julkaistu! Lue kansainvälisen asiantuntijamme esittely alta. Stuart Smith is Team Leader for Arup structural engineering in Berlin. 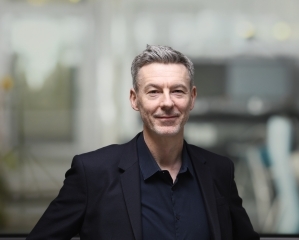 Since joining Arup in 1995 and working from London and Berlin, he has been engaged in the design of some of the world’s most exciting as well as challenging building projects including CCTV in Beijing and was the engineering team leader for the M+ competition entry with Herzog & de Meuron. His extensive project portfolio includes several tall buildings in seismic regions; arts and culture buildings including galleries, performance venues and libraries; sports venues as well as residential and commercial projects. Most recently, he has collaborated with Taller-G to deliver Reforma 509, a 238 metre tall high rise project in Mexico City which is currently under construction. In addition, Stuart has worked with many renowned artists such as Doris Salcedo for Shibboleth, Tate Modern 2007, and Ai Wei Wei for Serpentine Pavilion 2012. Stuart has an interest in new, innovative materials and techniques. His recent research work includes the Wikihouse; the world’s first open source, digitally-printed house built as part of the London Design Festival 2014 and The Circular Building in 2016 that explored the application of circular Economy principles to the built environment. At Lord’s Warner Stand, he investigated the pioneering use of Tensotherm, a fabric impregnated with nanogel to provide high thermal properties in a thin translucent roof covering. He also justified the use of the niobium enhanced high strength steel at the Reforma 509 project, a unique solution in a highly seismic zone. Koulutuksen järjestämisestä vastaavat yhteistyössä Suomen Rakennusinsinöörien Liitto ja Suomen Arkkitehtiliitto SAFA.